What is the Pandemic Emergency Financing Facility (PEF) and why is it needed? Pandemics pose a serious threat not only to global health security, but also to economic security and to our ability to end extreme poverty and achieve the Sustainable Development Goals. While outbreaks are inevitable, pandemics, if addressed early, are for the most part preventable. Money and support delivered at the right time can save lives and economies. Yet as we saw in the recent Ebola crisis in West Africa, there is currently no fast-disbursing financial mechanism to make available significant funds to resource-constrained countries early enough to help them fight an epidemic outbreak that is escalating. Time and again, the world continues to follow the same pattern: money isn’t brought to the table until a major outbreak hits an explosive point. Without a strong system in place, the world will simply continue to move from crisis to crisis. Four expert panels convened over the past year in the wake of the Ebola crisis concluded that the world must urgently step up our capacity for swifter, more effective pandemic response. A critical financing gap exists between the limited funds available at the early stages of an outbreak and the assistance that is mobilized once an outbreak has reached crisis proportions. The Pandemic Emergency Financing Facility (PEF) has been developed by the World Bank Group in collaboration with the World Health Organization, and supported by Japan and Germany, as well as private sector partners. It seeks to fill this gap by providing the much-needed surge funding for response efforts to help prevent rare, high-severity disease outbreaks from becoming more deadly and costly pandemics. What is the potential economic impact of a pandemic? Pandemics are one of the most certain uninsured risks in the world today. There’s a high probability that the world will experience a severe outbreak in the next 10 to 15 years that could destabilize societies and economies. Recent economic work suggests that the annual global cost of moderately severe to severe pandemics is roughly $570 billion, or 0.7 percent of global income. The cost of a severe pandemic like the 1918 Spanish flu could total as much as 5 percent of global GDP. Who is covered under the PEF, for what, and how much funding will it provide? While every country in the world is susceptible to disease outbreaks, low-income countries with relatively weaker health systems tend to be more vulnerable and less capable of mobilizing the financial resources to effectively respond to major outbreaks. Accordingly, the PEF will offer coverage to all countries eligible for financing from IDA, the World Bank Group’s fund for the poorest countries; those countries in turn would be eligible to receive funding in the event of an outbreak that meets the activation criteria for PEF financing. In addition, PEF can provide funding to qualified international agencies involved in the response to a major outbreak in affected countries. The PEF will provide more than $500 million to cover developing countries against the risk of pandemic outbreaks over the next five years, through a combination of insurance financed by bonds and derivatives, a cash window, and future commitments from donor countries for additional coverage. The insurance window is currently open as of July 2017 and the cash window is operational as of Summer 2018. How is the PEF financed? The PEF has two windows. The first is an ‘insurance’ window with premiums funded by Japan and Germany, consisting of bonds and swaps. Development partner contributions will cover the cost of the premia and bond coupons for the $425 million insurance window. The second is a ‘cash’ window, for which Germany has committed $61 million dollars. This will complement the insurance window and provide more flexible funding to address a larger set of emerging pathogens which may not meet the activation criteria for the insurance window. How will the PEF help bolster the response to a potential pandemic? By providing resources swiftly to countries and international responders to stem an outbreak before it reaches pandemic proportions, the PEF has the potential to save thousands of lives and protect economies. For example, if the PEF had existed in 2014 during the Ebola outbreak, the world could have mobilized $100 million as early as July to accelerate the emergency response. Instead, relying on pass-the-hat financing meant that money at that scale did not begin to flow until three months later – during which Ebola cases increased tenfold. Donors ended up committing more than $7 billion for Ebola response and recovery and overall economic impact of the crisis on Guinea, Liberia, and Sierra Leone reached $2.8 billion, according to the latest World Bank Group estimates. What are the criteria for accessing funds from the PEF? The PEF’s insurance window will rely on clear, parametric activation criteria designed with publicly available data. To “trigger” PEF financing under the insurance window, an outbreak must meet specific criteria related to its severity. These criteria are based on outbreak size (i.e., number of cases or number of deaths), outbreak growth (i.e., the outbreak must be growing over a defined time period) and outbreak spread (i.e., two or more countries affected by the outbreak). If these criteria are met, then the affected countries and/or eligible international responders may then submit a request for funding from the PEF. Payments will be guided by the principles of country ownership, speed, adequacy and flexibility. What about severe outbreaks that do not meet the PEF activation criteria, or diseases that are not currently covered by the PEF insurance window? Recognizing that severe outbreaks from unknown or newly emerging pathogens may occur that do not fit or have not yet met the activation criteria of the insurance window, the PEF is complemented by a cash window which gives it the needed flexibility that the insurance window cannot provide. The principles guiding the use of the cash window will be similar to those used for insurance, but with greater flexibility in terms of payment amounts, earlier payments and payments for diseases not covered by the insurance window. The cash window has four purposes: (i) to provide supplemental financing for pathogens covered by insurance, but that clearly merit larger or earlier payouts than provided by the activation criteria and allocation arrangements; (ii) to provide financing to severe single-country outbreaks; (iii) to provide coverage for new or unknown pathogens not covered by insurance; and (iv) to serve as a conduit for efficient and effective surge financing for development partners to channel resources to affected countries in the event of a crisis. How does the PEF complement the World Health Organization’s Contingency Fund for Emergencies (CFE)? The World Bank Group has worked closely with the World Health Organization (WHO) to design the PEF. The PEF will complement WHO’s Contingency Fund for Emergencies (CFE) and fill a critical gap in the current global financing architecture. 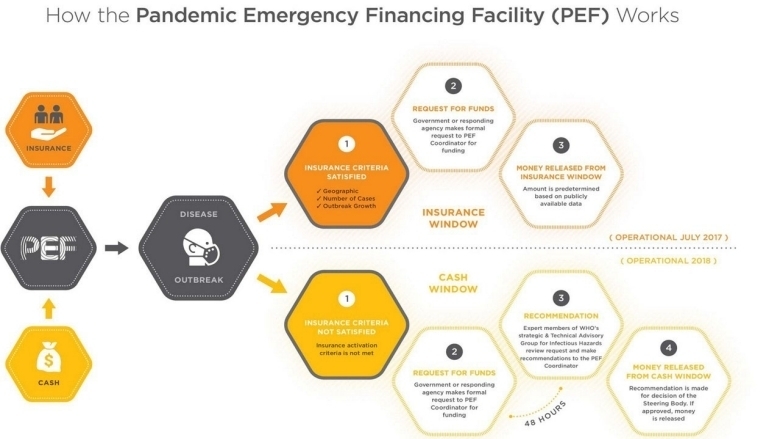 PEF financing is activated once an outbreak reaches a significant level of severity, well after the CFE has disbursed to support early response efforts. The CFE is also designed to respond not only to outbreaks but also to any type of emergencies with health and humanitarian consequences, including natural disasters. In contrast, the PEF is designed specifically to respond to outbreaks from a defined set of viruses with pandemic potential. What is the governance structure of the PEF? The PEF is governed by a Steering Body, whose voting members include Japan and Germany. WHO and the World Bank serve as non-voting members. Request for funds applications under the cash window are reviewed by expert members of WHO’s Strategic & Technical Advisory Group for Infectious Hazards (STAG-IH), and the recommendations are sent to the PEF Coordinator for decision by the Steering Body. Has the design of the PEF drawn on lessons from similar finance mechanisms? Yes. Using insurance to pre-finance sovereign risks is already a well-established tool for managing climate and disaster risks, and one that the World Bank Group has supported in the past. One example is the Caribbean Catastrophe Risk Insurance Facility (CCRIF), designed to provide participating countries with access to affordable and effective coverage against natural disasters. Another example is the Pacific Catastrophic Risk Facility (PCRAFI), a risk insurance pool of five small Pacific islands that was also incubated by the Bank. A third example is the Turkish Catastrophe Insurance Pool (TCIP), a mandatory scheme for homeowners’ earthquake insurance, which was backed by WBG financing at inception. However, the PEF marks the first time in history that pandemic risk would be covered by an insurance instrument. What are the key expected benefits of the PEF? The PEF will accelerate and improve outbreak response, save lives, and reduce the costs of response. Over time, the PEF is also expected to create a new market for pandemic insurance that will bring greater discipline and rigor to pandemic preparedness and incentivize better pandemic response planning. The PEF will also stimulate efforts by countries and development partners to build better core public health capabilities for disease surveillance and health systems strengthening, toward universal health coverage. How will the PEF help strengthen efforts toward pandemic preparedness? The PEF is designed as an emergency response mechanism, and as such it will not be used to directly finance pandemic preparedness measures. Other WBG instruments can be drawn upon to finance preparedness. Preparedness will be a special focus of the IDA18 replenishment. The PEF is not a substitute for investments on preparedness. As part of the PEF’s implementation, the WBG will further encourage IDA countries and other partners to prepare or update their outbreak response plans, which are an essential element of preparedness. Countries need resilient health systems with quality universal primary care and strong public health capabilities, with regional networks that can take disease surveillance and detection to scale. These investments are and will continue to be a priority for World Bank Group health financing through IDA and IBRD. And together with WHO, USAID and other development partners, WBG is also developing a framework to map domestic and international public and private sector funds available for preparedness, and help decision-makers complement and reinforce which types of financing are best suited to specific uses and situations. What is the timeline for launching the PEF? The World Bank Group announced the creation of the PEF on May 21 at the G7 Ministers of Finance Meeting in Sendai. Japan and Germany came on as donors and allowed for the PEF's insurance window to be operational July 2017. The cash window is operational as of Summer 2018.